I frankly found Wally's better. The adding folk to the blacklist was more intuitive (if a little clunky), it doesn't clutter with giving option to unhide things, and automatically puts all hidden threads as really hidden (you can't get them back). Less hassle. The only things I would improve upon it is hiding whenever someone's post is downvoted as well, just not wanting to see it at all. This is now what happens with the script with a downvoted post. Dan's userscript takes longer to load, makes the forum uglier with a grey background to everything, and adds options to unhide things. It also doesn't do anything to downvoted threads. I think what happened here was that Dan achieved a great flawless script, but didn't know when to stop and kept on adding stuff. It loads really quickly. The only thing that significantly lowers performance is that if you enable my userscript and Muli's userscript is that after around 2-3 seconds of loading certain pages (such as the all forum posts page) something causes the layout to look bad (extra columns to the left would be added), so I added a way that fixes the visual error (by removing the extra columns). Also, the bigger the script is, the longer it'll take for it to load, hence how my other script* loads faster. I know of ways to simplify the code further but that evolves using jQuery and I'm not all that familiar with jQuery. In comparison, Muli's userscript has a file size of 686KB while mine is only 121KB. In my opinion, it looks better if the background is a gradient rather than a solid colour. If you press the F12 function key and search for 'table.region tr' you could disable the CSS rule that says something similar to or includes 'background: linear-gradient'. How is this a disadvantage? If you've hidden something, wouldn't you want to see it again? I could make it 'optionable' to not show hidden things. What do you want to happen to downvoted threads? I added a feature that lets users hide and show downvoted threads as often as they like, instead of only being able to show hidden threads and not hide them again. If you read the first post of my thread then you would have noticed that I'm currently working on bug fixes. I'll keep on adding to it until I can't think of anything else to fix or add to. * = Wally didn't create any of the code himself and technically, I own it. Don't debate who owns it here; PM me instead. Unlike the other script, my script has a user interface (UI) and it's really easy to use. With the other script, you actually have to go into the code and add to the Block List there. Using the UI, it's easy for you to do this process; it's only one click of a button at minimum to add a player to your Block List. I think I'm going for Wally's script, it's much better. This is a pretty lame bait attempt. 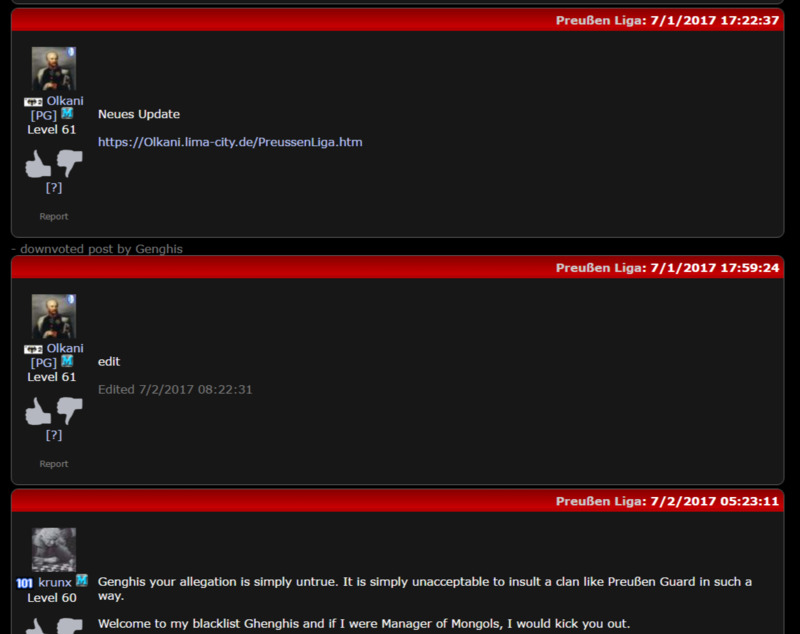 Frankly, I don't even use any of the userscripts cuz I've seen a lot worse junk than some browser game's forum. I'd imagine however, that the difference between the 2 scripts is marginal/subjective at best, and probably not even noticeable or really anything to complain about given that it's free. In comparison, Muli's userscript has a file size of 686KB while mine is only 121KB. Come on Juq! All the cool kids run both at the same time! Welp, Dan has agreed to work on making his userscript more customisable, though I don't think it will change the speed. It's just annoying for that 0.1 seconds. The "other script" is pretty much instant. But the next version could be a bettering. Dan, I don't want your script anyways. No offence, but same here. Wally's is smaller yet has almost everything you need. If you could release 2 versions, one "light" and one "heavy" of your userscript, that'd be much more appealing.